Does your smile confidence suffer from crooked, crowded, gapped or otherwise misaligned teeth? If so, you don’t have to live for two years with bulky metal braces– you can enjoy straighter teeth and a more beautiful smile with Invisalign in Marysville! Keep reading to learn how Invisalign stacks up against traditional braces from the team at Darby Dental. Invisalign is a revolutionary system that uses a series of custom-fit aligners to gradually shift teeth into their preferred position. Unlike metal brackets and wires, these removable trays are comfortable and discreet, allowing you to live your life without the interruptions of traditional orthodontics. 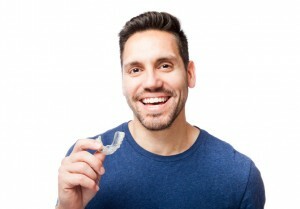 To set you up with your custom Invisalign treatment, your dentist will take multiple impressions and photos of your teeth and decide the best plan of action for your unique smile. This important information will then be sent off to the Invisalign lab, where your trays will be created just for you. Once they’re ready, you’ll receive them conveniently the mail — and you can begin your orthodontic treatment immediately. You’ll wear each tray for about two weeks before advancing to the next in the system. As long as you follow the recommended 20 to 22 hours of daily wear, you can remove the trays whenever you need. The average Invisalign treatment lasts about one year. Adults who are interested in improving the alignment of their bite without enduring the stress or hassle of traditional brackets and wires enjoy the wealth of benefits offered by clear braces. Some of the most common advantages of Invisalign include the following. Removability allows you to keep living your life, just like you’re used to. Wear the trays as directed and you can feel free to subtly slip them out before meals, to brush and floss or before your next big presentation at work. Because it’s got a shorter treatment time and requires fewer visits to the dentist overall, Invisalign is far more convenient option in orthodontic treatment. Busy adults especially benefit from the low-maintenance solution. Most patients will find the smooth, plastic Invisalign aligners more comfortable than traditional braces, which often rub blisters in the delicate cheeks, tongue or gums. Good candidates for Invisalign are those who are dealing with mild or serious orthodontic issues and are in good oral health. Patients with severe tooth decay or gum disease will need to have these issues fixed before or during their Invisalign treatment. If you’d like to get started on your invisible orthodontic treatment, what are you waiting for? Contact Darby Creek Dental to get started today! We can’t wait to show you how beautiful your smile can be.